No manual or box included. Limited Quantities! I will respond ASAP. Metroid: Zero Mission (Nintendo Game Boy Advance, 2004). Condition is Good. Shipped with USPS First Class Package. The developer of this rom was truly dedicated, spending years creating this pristine Rom Hack. The normal “do one area and then the next” play has been replaced with having Samus traverse various areas before encountering even the first boss. Trending at $49.99eBay determines this price through a machine learned model of the product's sale prices within the last 90 days. The Boxes are in VERY POOR condition with many dents / creases / wear. The box and instruction manual are NOT included. I popped it into my GBA SP to give it a whirl again. Photo is generic and for reference only. Hello you are buying this great game tested and working. What you see is exactly what you get so please feel free to judge the pictures for condition or ask if you may have any questions. Makes a great gift! Feel free to check out our other video game listings. Free shipping! Metroid: Zero Mission (Nintendo Game Boy Advance) Gameboy NEW & Sealed! The box has minor wear on the corners/edges. 100% Authentic Nintendo Version. 4.5 out of 5 stars - Metroid: Zero Mission (Nintendo Game Boy Advance) Gameboy NEW & Sealed! 104 product ratings104 product ratings - Metroid: Zero Mission (Nintendo Game Boy Advance) Gameboy NEW & Sealed! You are purchasing and unopened copy of Metroid: Zero Mission for Gameboy Advance. Straight from store to shelf. It has one minor tear in the plastic wrapper at the top/back (pictured). Shipping is free in the US. Label is clean! Condition: Used - Good. NEW Metroid: Zero Mission Nintendo Game Boy Advance GBA Factory Sealed! 4.5 out of 5 stars - NEW Metroid: Zero Mission Nintendo Game Boy Advance GBA Factory Sealed! 104 product ratings104 product ratings - NEW Metroid: Zero Mission Nintendo Game Boy Advance GBA Factory Sealed! No Major Flaws. No writing. No cracks in casing, no rattling pieces. Gaming Supplies. Component Included?. Original Box NO n/a. If you have a US system then yes it should. Condition: used in near mint condition. Metroid Zero Mission + Metroid Fusion (Game Boy Advance) GBA Cartridge Only! These title(s) were released back in 2002-2004 and is a must own for any collector looking to complete their collection. Acceptable/Good condition overall. You are unhappy with your buying experience in. Everything is in excellent used condition, with normal signs of wear. Check out the photos! This item does not have any hand writing on it. LIFE IS SHORT. This item is in a clean condition, and not covered in dirt, dust, or corrosion. 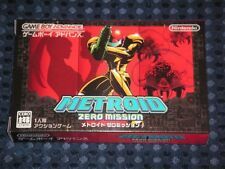 ULTRA RARE, BRAND NEW, FACTORY SEALED, USA VERSION of METROID ZERO MISSION for GBA!! Excellent condition, no dents or noticeable blemishes!!! Get it now while it lasts!!! Authentic cartridge. Tested and fully functional. Metroid: Zero Mission (Nintendo Game Boy Advance, 2004). Condition is Good. Shipped with USPS First Class Package. The manuals, artwork and cases are in the best shape I could find them. - I never resurfaced them, however I cannot attest that they've never been resurfaced. Metroid: Zero Mission (Nintendo Game Boy Advance, 2004) w/ game manual. Condition is Very Good. Lightly used. Shipped with USPS First Class Package. Please let me know if you have any questions or concerns. Note the embossed numbers on the close-up photos on the Nintendo seals. only -- no manuals or boxes. Tested & working -- see photos! 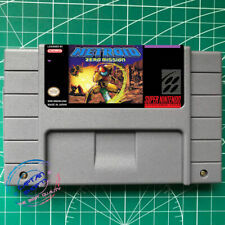 Metroid: Zero Mission (Nintendo Game Boy Advance) GBA video game cart Samus M:ZM. Condition is Acceptable. Shipped with USPS First Class Package. Metroid: Zero Mission (Nintendo Game Boy Advance, 2004). Condition is Very Good. Shipped with USPS First Class Package.